Carbon native, Mallorie Bradley, came to USU Eastern with potential in her hands. She is a leader on many levels. Not only is she an ambassador, she is president of the Institute for the Church of Jesus Christ of Latter Day Saints. Her favorite part of being an ambassador is getting to talk with high school students and sharing why she loves USU Eastern. Bradley has lived in Carbon County her entire life, where she attended Carbon High. 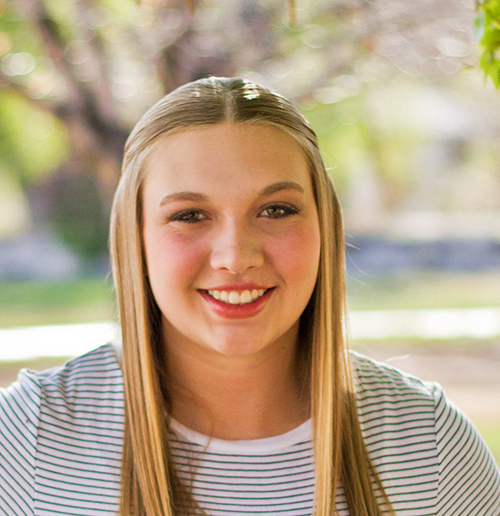 She was involved in many activities including basketball, softball, volleyball, drill, and women’s choir. Even though she admits it is boring, Bradley’s favorite color is gray. Her bedspread and much of her belongings are gray. Her favorite food is steak, but she loves all types of food. She is not a picky person, but unfortunately has discovered that she is allergic to many types of food. She breaks out in a rash under her chin if she eats tree nuts, pine nuts, rice, potatoes, wheat, gluten, soy, and sesame seeds. This doesn’t always stop her from eating them though. The new movie “Cinderella” and “The Greatest Showman” are her favorite movies. She loves country and pop music because they are fun genres to dance to. Her favorite celebrities are Justin Bieber and Taylor Swift. A talent Bradley wishes she had is being good at dancing. Despite her own doubts, people have comment on her ability to dance and believe she is an expert. Bradley’s biggest regret in life is not being as nice as she could be to her family. Her biggest self doubt is not measuring up to other people. Reading isn’t a common activity Bradley does, but she likes when she can find a good book. Her favorite school subject is English because of her amazing professor, Carrie Icard. She doesn’t like math. If money was not a problem, Bradley would “definitely want to live in Tahiti or Bora Bora in a cute little bungalow right on the ocean.” Traveling is no stranger to Bradley. She has been to Namibia, Africa, three times to hunt with her family. She claims it is the coolest place she has been. Her family plans on returning there in a year. Bradley plans on moving to Logan next year for school. She wants to get a master’s degree in speech and language pathology. She sees herself with a cute little family and being happy with life. People say Bradley is the nicest person. She will do anything for anyone and has a kind heart. She is always so generous and giving to others. She loves being happy and is encouraging to the people around her.